[ARCHIVE] neoBrainformation • View topic - Ear cropping? I recently placed a deposit upon a Doberman Pinscher puppy (whom we are picking up next weekend). I've already decided upon her name...I've gone the Shakespearean route, this time -- the name will be Lucetta, i.e. after a character from Two Gentlemen of Verona -- the nickname will be "Lucy," which goes well, since that name is also associated with a famous redhead (Lucille Ball)...-- and our puppy's color is VERY red, indeed! Now, the only question remaining is what to do with her ears: to crop, or not to crop??!!?? My husband is highly inclined to want to crop, and yet, I am hard-pressed to find a medical reason to put this puppy through such trauma. Any thoughts?? I appreciate any advice you might be able to give me on this -- thanks! I am very much against unnecessary surgery for puppies or dogs. We have had five greyhounds over many years and lots of unnecessary things had been done at the tracks; they file their canine teeth so they can't hurt other dogs by nipping; a couple had their ears docked to make them more aerodynamic!! A few years ago our present grey fell on the ice and broke his tail about halfway down. The vet that ended up docking the whole tail told us what trauma the dogs go through when something like that happens. It hurts like hell and you can't really be told when to administer the pain pills. 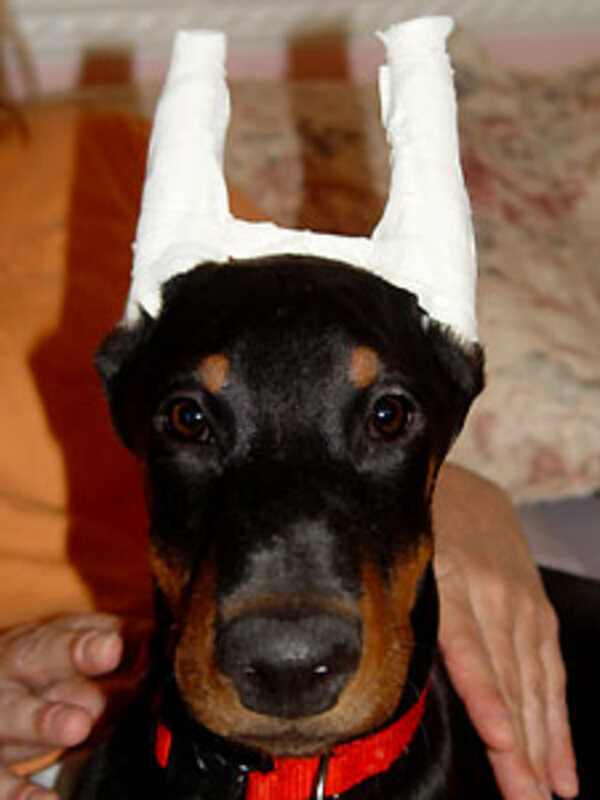 I think a doberman would look more friendly and at ease with slightly floppy ears. Those that have their ears docked look mean. ...but that's just my opinion. EDIT: when I answered this question I didn't notice it was directed to our resident vet tech. Sorry. But I still stand on my original opinion. My ex and I raised Dobies (the ultimate dog). The only reason to crop ears is for the show ring (which may have changed as that was many years ago). There is no real reason beyond looks. They have a kinder, gentler look with natural ears. I've heard that things like ear docking, tail docking, etc are going out of fashion - even in the show ring. I believe it's illegal in some countries (I'm not sure about NZ, I must find out) to dock a corgis tail, eg, so they remain Welsh Corgis. well, i can agree with tail docking in rottweilers - i have first-hand experience of getting whipped by a rotti's tail and it HURTS. their tails are incredibly long and muscular, too. my friend's rotti was natural but the vet recommended docking because he was constantly knocking his tail on things like door frames and getting haematomas that had to be surgically treated. she is against the procedure so kept refusing even though i pointed out that in his case, it wasn't exactly cosmetic. The AKC believes that "that ear cropping, as described in certain breed standards, is an acceptable practice integral to defining and preserving breed character and/or enhancing good health." if that's how they feel, then perhaps they should concern themselves with developing earless and tail-less versions of the breed - to my mind, if it's surgically created, how can it even qualify as a "breed standard"??? How sad is this picture? If you are set on cropping a dog's ears, do so before the cartilage sets at the age of 5 or 6 months. But it will STILL hurt him! Ear cropping is a painful and scarring procedure. It is done when the pups are of an age that they feel pain and some places do it without anesthetic. Tail docking and dewclaw removal surgeries are done at a time when pain (while felt) is not identifiable as "pain" yet. Think of male circumscision. There is no medical reason to crop ears. Its purely a look. Technically most pet dogs do not need tail docking either, tail docking is used to protect the dog that is working in certain situations. If you need more information, please message me and I will get you some sources of more in depth reasons not to crop ears. my lucy has floppy ears too! oh - i should mention, too: ear cropping leads to a world of hurt via ear infection. the dog's ear canals are left exposed and, unlike humans, dogs can die from ear infection as the inner ear connects with the brain.